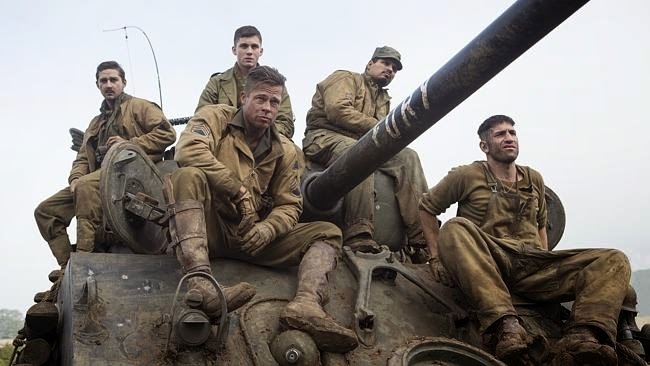 This is a testosterone fuelled macho war film where Brad Pitt playing tank commander Wardaddy guides his four charges through the brutal final days of 'total war' in Germany in April 1945. This film is not pretty or easy to watch but the acting and narrative are both compelling which does make this a film worth engaging with. The film draws on a number of cliches as it mirrors scenes from other war films and parts of it are quite predictable. With action sequences reminiscent of Saving Private Ryan for their visceral portrayal of war and much of the film spent in the claustrophobic confines of a Sherman tank, it offers an opportunity to explore the indiscriminating horror and consequences of war - even 'just war'. As Wardaddy says "Ideals are peaceful. History is violent". Yes - very violent. Set in a time before PTSD was recognised, it gives glimpses of the psychological pain and terror war inflicts. With so many wars rumbling on around the world today what are we doing to ourselves? This film packs a lot into the storyline and the character developments are good. Some characters are likeable - others not so. The way the tank crew have fought their way across North Africa, Italy, France and now Germany have made them into a close-knit team. When one of the crew dies early on and the replacement is a church-going typist you get the feeling that rites of initiation are not far off. War is horrible. Mud is everywhere. Bodies and body parts litter nearly every scene. Cruelty and brutality are ever-present. Yet there is also growth, compassion, tenderness, regret, sacrifice, heroism, hope and love. This film is filled with emotion and people trying to do good things in a bad world. The film also graphically shows how inferior allied armour was in the face of German armour. I was born in West Germany because of this war - and only 13 years after the film was set! This compels me to explore WWII films with an imperative that some others might not have. It is part of who I am - as it is for countless thousands of others. Some scenes seemed more than a little unrealistic. I am not an expert but I would imagine that two grenades exploding inside the sealed confines of a tank would do something to the bodies inside the tank. Instead, after the detonation they are remarkably unscathed. This film will divide opinion. I wonder what you will make of it. At 134 minutes I felt that it didn't drag at all. It's not a must-see film - you will know if it's one for you. I'll give it 7/10.